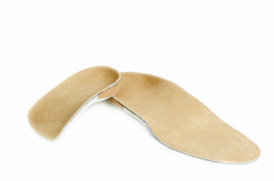 This orthotic is formed from a Polypropylene shell with a ultra high density EVA heel post. These can be made from a plaster cast or a foam impression cast. The shell is either a 3mm thickness or for patients requiring greater rigidity 4.5 mm. These devices have a polypropylene shell with a high density heel post and a medium or low density EVA in the mid-foot. They are designed for those who need a little more support than the standard device and are often used in conjuntion with a medial flange (see shell modifications). 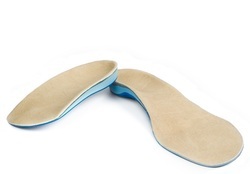 These are suitable for clinicians using foam casting or plaster. This is one is our most popular sports device combining shock absorbtion, control and durability. It uses a flexible polypropylene shell with a full length low density EVA base post. Internal cushioned linnings can also be applied. 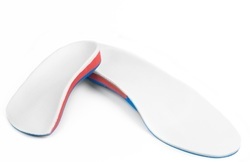 A follow on from the popular sports device this orthotic has a medium density heel post. 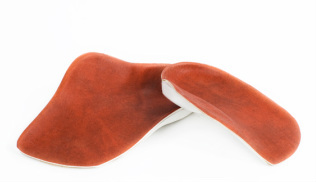 This gives it slightly greater rearfoot control as well as greater durability. 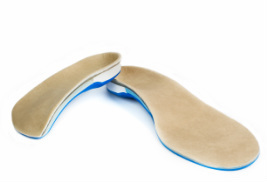 The ultraflex as the name sugguests is for patients who require very gentle control with a high degree of shock absorption through the mid foot. Made with an ultra flexible polypropylene shell, this device is mainly used for patients with foot pathologies which do not permit rigid control, but which necessitate soft support. One step up in rigidity from the ultra flex this device has a medium density EVA heel post to give slightly more rear foot support while still being very flexible through the mid-foot. This device as the name sugguests is the ultimate in control and is often used for patients who have progressed from the use of a full AAFO (Articulating ankle foot orthotic). It is normally made in 3 mm polypropylene and it has a medium density EVA base post. The control primarily comes from the ultra high medial butress flange which controls the talo/navicular joint. It is best made from a non-weight bearing plaster cast with the forefoot corrected during casting. 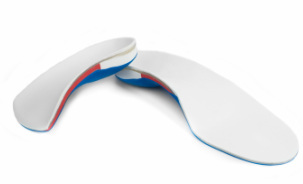 These dynamic orthosis are the most recent addition to our range and represent one of our greatest advances in orthotic therapy. The devices are used for patients with severely limited ankle dorsiflexion and as the pictures demonstrate they actually replace much of the movement of a damaged ankle joint. Therapeutically this means that patients can be spared the breakdown of the mid-foot normally associated with this type of injury and can therefore enjoy much greater mobility. We have now developed an ankle brace which incorporates the rocker and this has been successfully used in patients who have suffered severe lover limb and ankle trauma.